Тут ви бачите Напівсинтетичне мастило Rock Oil Guardian 10w-30 — 1 літр. У нашому інтернет-магазині ви також знайдете тисячі інших високоякісних запчастин за привабливими цінами. A premium grade semi-synthetic 4 stroke engine oil. Increased performance together with the longer service periods of a modern engine have put more demands on the engine oil. 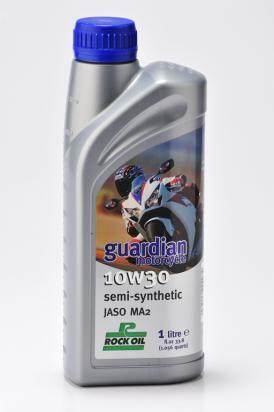 Guardian semi-synthetic has been developed to give maximum protection, with rapid circulation at cold start and complete protection at high temperatures even in the most extreme environments. This has been achieved by using the very latest technology in synthetics and additives to guard against wear whilst reducing deposits.